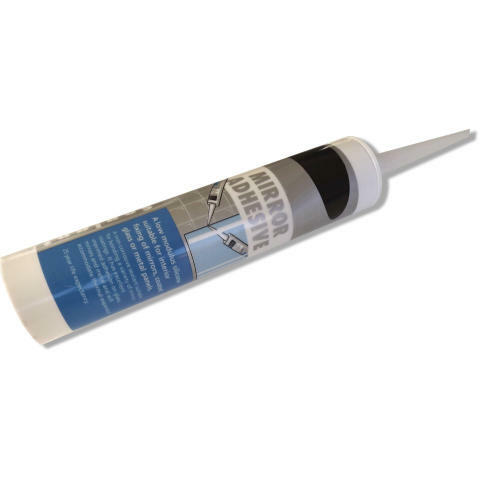 Mirror Adhesive Standard 310ml Tubes Suitable for use with Glass Mirrors. Extra Fast Grab Mirror Adhesive Extra Strong Holding Capacity Fast Curing, With Skin Formation in About Five Minutes Low VOC, Solvent Free, Low Odour Whilst the adhesive has an almost instant grab there is abilty for small adjustment once the mirror has been placed to the wall. NOTE: This may be more difficult with larger mirrors Apply adhesive in vertical beads of 120 – 150mm apart, starting about 70mm from the edge. Mount mirror within 5 minutes of applying adhesive. Support mirror mechanically (mirror clips, etc.) until adhesive dries. Do not apply adhesive if the area temperature is below 15.5ºC 60º F. Read and follow adhesive instructions carefully. Clean mirror with a micro fibre cloth and soapy water, or a cleaning product suitable for use with glass mirrors.